Carlos knows when the soldiers arrive with warnings about the Communist rebels, it’s time to be a man and defend the village, keep everyone safe. But Mama tells him not yet—he’s still her quiet moonfaced boy. The soldiers laugh at the villagers, and before they move on, a neighbor is found dangling from a tree, a sign on his neck: Communist. Mama tells Carlos to run and hide, then try to find her. . . . Numb and alone, he must join a band of guerillas as they trek to the top of the mountain where Carlos’s abuela lives. Will he be in time, and brave enough, to warn them about the soldiers? What will he do then? A novel in verse inspired by actual events during Guatemala’s civil war, Caminar is the moving story of a boy who loses nearly everything before discovering who he really is. As a huge fan of MG science fiction, I was totally excited to read Rachel Searles’s debut THE LOST PLANET, which released in January. I was going to review the book myself until I realized I have a much bigger authority in the household: my 10-year-old son, Jonah. He’s generously agreed to answer my questions (and I didn’t even need to bribe him with extra TV time)! Wait, that’s one of the questions? For real? Tell us about the story in THE LOST PLANET. So Chase doesn’t have any memory. And the whole story, he’s trying to find his memory again. He’s on a planet called Trucon. He meets a kid named Parker, and he has a robot named Mina. Chase has a message, “Guide the star.” But he doesn’t know what that means. He’s told to stay away from the fleet, and there’s a mysterious fleet soldier named Lieutenant Maurus. What was the coolest part of the book? The coolest part was when the Goxar were attacking the ship Chase is on. That part was cool because it was a mini-battle, because Mina and Maurus were fighting the Goxar. Which character did you like the most, and why? I liked Lieutenant Maurus, because you never knew which side he was on. As you know, I love monsters. 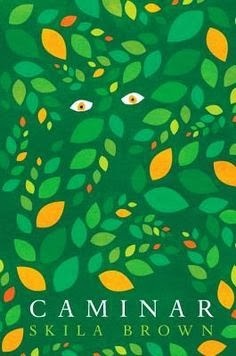 Were there any great monsters in the book? Yeah, like I mentioned earlier, there were the Goxar, who were aliens with poisonous spikes on their back. There were also these cool creatures with claws on their backs. And there were also these monsters called Ambessitari. 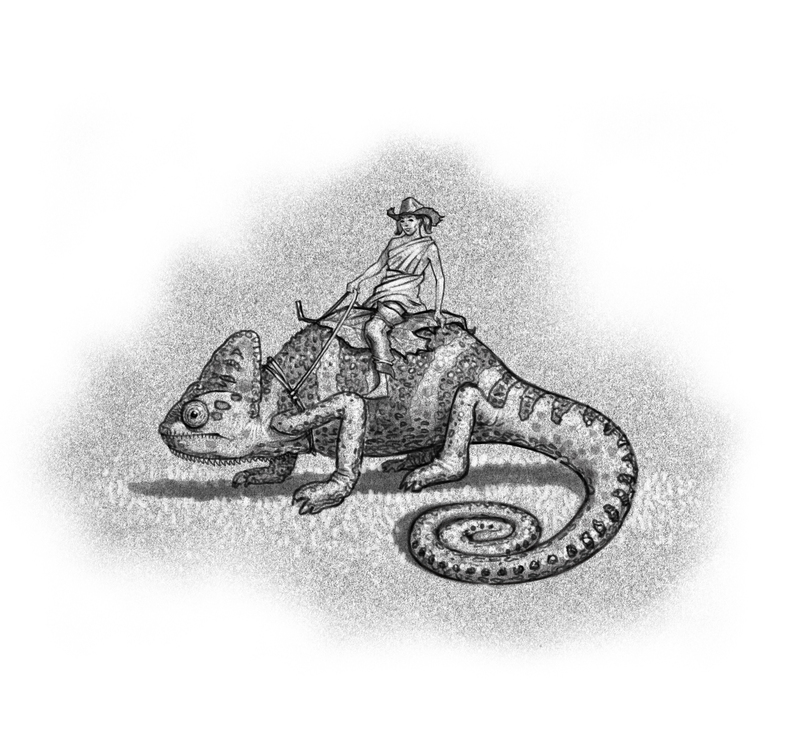 They were tricky, and they served their master, who was called Rezer Bennin. Now for the final and all-important question: on a scale of 1 to 5, how many little green space dudes would you give THE LOST PLANET? Thanks, Jonah! Be sure to tell me about the next cool book you read, okay? touch me. I almost want to pull his hand to my face, close the gap and let go. Today, we’re chatting with Rachel M. Wilson. You know the drill: one author, four questions! Rachel’s YA contemporary, DON’T TOUCH deals with anxiety, theater, divorce, and so much love. It will be out from HarperTeen on September 2, 2014. Well, my college roommate was a witch and . . . No. Nope. Not telling that story . . . For the record, while my debut is realistic contemporary, I’m a big fan of fantasy and horror! In reality, I’ve been working toward publication for a long time. A few lines of this book were written when I was in college, but I didn’t develop the story into a novel until years later, when I was studying for my MFA at Vermont College of Fine Arts. I wrote two full drafts during the program, and the second was a major rewrite. To give you some idea, the book used to be called Manatee, and a manatee played a major role in the plot. Today, the book contains a total of zero manatees. After I graduated, I continued revising, cutting, adding, until I got the guts to submit to agents. My dream agent, the amazing Sara Crowe, had seen me read from the book at an alumni retreat at VCFA and seemed to like what she heard. When I queried her, she accepted, and the book sold at auction to the delightful people at HarperTeen in February of 2012. 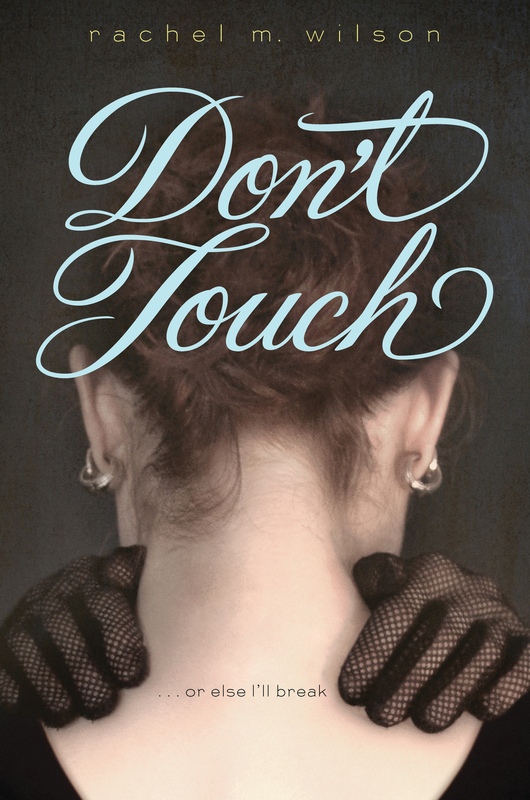 Don’t Touch is the story of Caddie, a 16-year-old girl who’s recently been accepted to an arts high school to study theater. Caddie wants to play Ophelia in the academy’s production of Hamlet, and she wants to renew her friendship with her former best friend, Mandy, but she’s troubled by a fear of touching other people’s skin. Caddie’s parents are trying out a separation, and she creates a rule for herself that if she can avoid touch, she might be able to prevent her family from falling apart. Of course, it’s difficult to act without touching other actors. It’s hard for Caddie to act normal in front of her friends when she so clearly isn’t, and it’s hard to deal with her feelings for her fellow actor, Peter, who seems like a shoe-in for the role of Hamlet. Cool details? I think it’s pretty cool that the book is set in Birmingham, AL, my hometown. Birmingham is a decent-sized city, an old iron town built around train tracks, but it definitely has some Deep South flavor–red-orange clay, hills covered in kudzu, plenty of BBQ and ham-laced greens and grits . . . 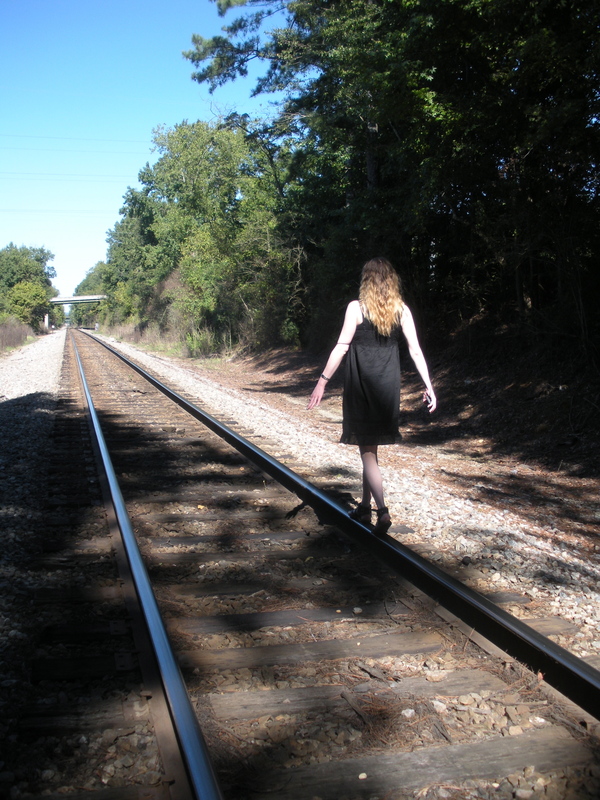 There are some scenes set in old Irondale, by the train tracks, and around an abandoned swimming pool in the middle of the woods. These settings are inspired by real places. During revisions, my sister accompanied me in taking pictures for inspiration. Baby pool with the big pool in the background. 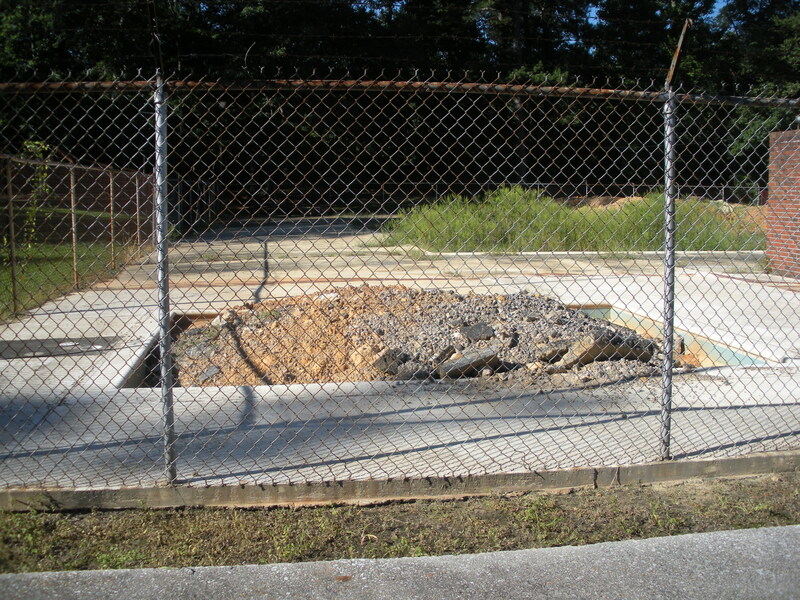 This is the wreckage of Irondale Swim & Tennis where I used to swim as a kid. I visited it while drafting Don’t Touch, and was surprised to find it abandoned. That inspired a scene which is still part of the book. The picture you see here was taken a year or two later–on my visit that inspired the scene, the pool had not yet been filled with dirt, much less grass, and still had water in the bottom. Why the fear of touch? As a kid, I had OCD (obsessive-compulsive disorder) starting around age ten. For several years I was afraid to touch lots of things–not just people–and I was a magical thinker, constantly worried that I might cause something bad to happen just by thinking about it. By the time I was in high school, I’d gotten help for it, but I still had a lot of anxiety, and that made it hard to be open with other people. At the same time, I was good at putting on a happy face and hiding what was going on with me. Like Caddie, I loved acting because it allowed me to hide behind a character and to connect with people in ways I wasn’t bold enough for in real life. So while the plot and characters are definitely fictional, the novel had its spark in experience. Fear has loomed large in my life. I wanted to explore how fear can separate us from other people and from our passions, and how those same people and passions can sometimes combat fear. I decided to focus on the fear of touch because it serves as an extended metaphor for Caddie’s struggle to be open and vulnerable to other people. You don’t have to have experienced mental illness to relate to that. Caddie’s fears are heightened versions of the fears we all feel . . . the fear of abandonment, the fear of change, the fear of coming into one’s own power . . . 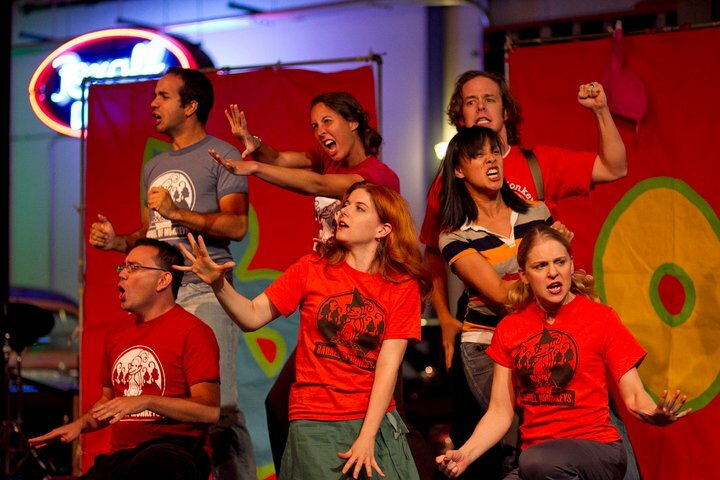 I do a lot of work with an amazing theater company called Barrel of Monkeys. We teach writing workshops in Chicago Public Schools and adapt the students’ writing for the stage, often with comedy and music. I coordinate our after-school program, teach, and play roles ranging from a homicidal church bell to a two-timing cheerleader to a rampaging American Girl Doll–whatever the kids can imagine. It’s the most fun ever. If you want a little taste, here’s a link to one of my favorite Monkey songs, “Bad Car,” which is adapted word for word by musical theater guru, Jonathan Mastro. Aside from that, I do lots of odd jobs–the oddest involves pretending to be sick to help doctors learn. 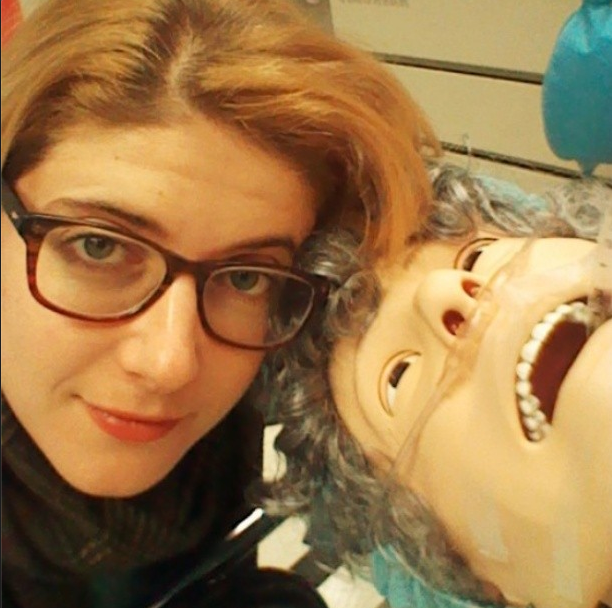 Sometimes, I get to pretend to be a surgeon or nurse and save mannequins’ lives. It’s always educational, and a not-so-terrible side effect is that I want to set all my scenes in hospitals these days. My coworker had a rough day. Lately, I spend way too much time on Tumblr. For myself, for the OneFours, and for my PhD in Superheroes! We have a lot of fantastic authors at OneFour KidLit and are excited to introduce them all to you. One author, four questions. 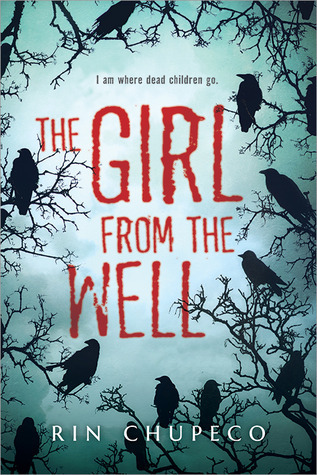 Today we’re talking to Rin Chupeco, author of THE GIRL FROM THE WELL. And while not technically an undead spirit herself, Rin has been mistaken enough times as one hat she feels she can competently write about them. It almost didn’t. I live in the Philippines, where writing speculative fiction locally was discouraged – mostly because nobody has ever eked out a decent living from them. The chances of successfully establishing myself as an author in the international scene was even lower. For the longest time, I believed people when they said it wasn’t worth the effort, until a chance encounter with a rather famous writer (here’s a hint: his name starts with an ‘N’, and ends in an ‘eil Gaiman’) convinced me I’ll never know if I never try. The thought of a nine to five job for the rest of my non-pensioned life finally scared the crap out of me, and I began to write. At first they were short stories, which got me into local and online indie publications, but with little financial compensation. From there I soon graduated to novels. I wrote a book, queried it for awhile, then shelved it after realizing I’d made the neophyte’s mistake of querying too soon. My experiences in an old building where I used to work, combined with an odd conversation with a friend about horror movies, inspired me to write a second book, which I did in roughly three months, falling back on my love for creepy Asian things and psychological ghost stories. I knew this was THE ONE after I penned the final draft; I knew it was different, I knew there was nothing like it out yet, and I thought the concept was unusual enough to be noticed. Requests started coming in as soon as I started querying, and I eventually signed on with Rebecca Podos and Nicole LaBombard from the Helen Rees Agency. A few months later, I accepted a publishing deal with Sourcebooks, and have been thrilled ever since. THE GIRL FROM THE WELL is based on the Bancho Sarayashiki, which is one of the most popular ghost stories in Japan. It’s about a young maidservant accused of something she didn’t do, but was thrown down a well as punishment. Now her ghost rises nightly from that well, unable to rest in peace. It’s the same story the movie Ringu / The Ring was based upon, but while the relentless Sadako is driven by hate and rage with little reason, my protagonist has something few ghosts are able to retain in the afterlife: a conscience, however slight that may be. This doesn’t stop her from being violent when the situation calls for it, and while she considers most of what she does true justice, I wouldn’t say she’s been able to temper it with mercy when it comes to many of her victims – though she’s forced to reassess her centuries-old vengeance when innocent humans become involved. It’s a tale of redemption, a love story without necessarily being a romance – and it’s a story about how even the worst of monsters might still deserve what most people are often given: a second chance. Are there any other ghost stories / urban legends you enjoy other than the Bancho Sarayashiki? Right off the bat, I’m gonna say that Japan has some of the weirdest ghosts you will ever read about. One is Hanako-san, a little girl who has a predisposition for haunting toilets. She appears only after you knock at the third stall of a school bathroom on the third floor, and ask for her by name, much like the Bloody Mary legend. Outcomes vary, from apparitions of a bloody hand, to her killing the caller rather gruesomely. Another more horrifying ghost is the Kuchisake-onna, a woman who wanders around with a mask on who stops and asks people if she’s pretty. If they say no, she kills them; if they say yes, she takes off her mask and shows them a mouth that has been slit from ear to ear, and asks them again. Another “no” gets them killed, and a “yes” will make her slash their mouths to give them the same disfigurement. Not exactly a good outcome for both answers. Philippine mythology doesn’t get as much popularity as I think it deserves, too. There’s the legend of the manananggal, who’s usually a pretty girl in the daytime. At night, she has the ability to sever her body from the waist up, sprout wings, and fly over rooftops looking for babies and pregnant women to feast, on with a long prehensile tongue that can slip through small cracks in ceilings for this purpose. And there’s the tiyanak, which manifests as a crying baby apparently left in the woods or at an abandoned lot, and turns into basically an evil gremlin the instant you pick them up. I am a huge sucker for stories like these! 1. I was born and raised in the Philippines, but am ethnically Chinese for the most part. (I’m something of a mutt, with some Malay / Thai / Spanish / etc. trawling through the family bloodstream, though we’ve never been able to pinpoint a more definite ratio). This might explain why I’ve got huge eyes for an Asian, but STILL does not explain why I’ve got the body of a short thirteen year old girl while other family members are built like models. 2. I have foldable hands, in that I can fold them lengthwise, due in part to an old diving-into-a-shallow-pool-because-I’m-an-idiot incident. This gives me no superpowers whatsoever, other than the ability to gross people out. I’ve always loved tiny creatures: fairies, sea monkeys (yes, they ARE people, haven’t you seen the ads? ), and even leprechauns. So it’s no surprise that my debut novel, BY THE GRACE OF TODD, is about a boy and the tiny civilization of humanoids that have sprung from the grime of his grungy baseball sock. Today, I’m going to discuss how I developed the Toddlans. When Todd first discovers the tiny race on his sock, they are dressed in togas made from fibers and live in crude huts made of his filth. Their language at this point is a series of grunts and coos, which Todd’s baby sister, Daisy, happens to speak fluently. They live like cave men, roasting toe jam over tiny fires. Toddlandia, Toddlandia, our love we pledge to thee. How about you? Do you believe in wee folk? What’s your favorite read involving little people? Today we’re talking to Dana Alison Levy. Unlike her characters, she does not have an invisible cheetah, or an endless desire to make cat barf jokes. That doesn’t mean there aren’t some true facts buried in her funny Middle Grade debut, THE MISADVENTURES OF THE FAMILY FLETCHER, which will be out in July from Delacorte Press/Penguin Random House. She’s just not telling what they are. The old-fashioned way. I wrote a book, then I wrote another book, then I queried literary agents, then I wrote another book, and so on. THE MISADVENTURES OF THE FAMILY FLETCHER was, I think, my fourth book, and when superagent Marietta Zacker called to offer representation I was downright giddy. In all honesty, it seems I spent my career writing but pretending I wasn’t writing. By that I mean I worked in marketing, small business management, executive recruiting, and more, and in each job, what I was best at and enjoyed the most was…wait for it…writing. I lost my job in the 2009 recession. While I looked for work and hung out with my young children, I decided that what I really wanted to do next was the same thing I had wanted to do on Career Day in third grade: I wanted to write. Now I freelance for for a bunch of clients, writing on a variety of random and weird topics. And I write books for kids and young adults (also, honesty compels me to state, on a variety of random and weird topics). It’s a story about the new school year for a wacky and shenanigan-filled modern family with four adopted boys, two dads, and an ever-changing number of pets. Someone called it THE PENDERWICKS meet Modern Family, and that’s probably about right. As for a cool detail…well, originally, the dog’s name was Walter, and someone pointed out the folly of another boy’s name in a family that already had six of them. So I asked a group of writers — I was at a writing retreat — for advice. And one of my writer friends, who has an awesome southern drawl, said, “Well, growing up our dog was Sir Puggleton!” Boom. A new dog name was born. Well, one very cool fact is that I actually come from a distinguished line of writers! Both my aunt, Elizabeth Levy, and my cousin, Robie Harris, are children’s book authors, with well over a hundred books between them. So I’ve been lucky in that I have sympathetic mentors and cheerleaders throughout the grueling process. In case anyone’s wondering though? Nepotism doesn’t really get you anywhere in publishing. I was pulled from the slush pile, like everyone else. (But my collection of signed books is pretty impressive)! Also, I can wiggle my ears. TIME OF WONDER by Robert McCloskey: Oh, the evocative images and language used to convey coastal Maine in all its glory! ALL OF A KIND FAMILY series, by Sydney Taylor: Loved these stories of a Jewish family in New York in the first half of the twentieth century. 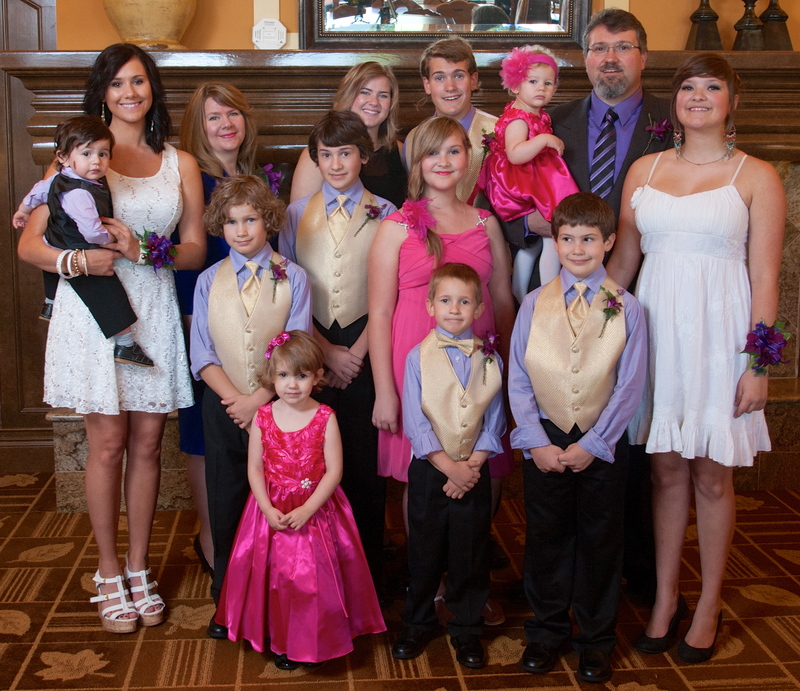 (Hmmm…four girls in the their family, four boys in the Fletchers. Never thought of that). ANGUS, THONGS, AND FULL-FRONTAL SNOGGING by Louise Rennison: Writing the funny is hard, and this author nails it again and again. Laugh out loud silliness. JELLICOE ROAD by Melina Marchetta: Beautifully written, incredible characters, and a plot that pulls together so perfectly I want to weep. Dana Alison Levy was raised by pirates but escaped at a young age and went on to earn a degree in aeronautics and puppetry. Actually, that’s not true-—she just likes to make things up, which is why she writes books. Her middle grade debut, THE MISADVENTURES OF THE FAMILY FLETCHER, is due out in July 22, 2014, from Delacorte Press/Penguin Random House. She really hopes it’s funny.